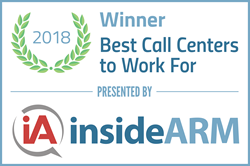 State Collection Service, Inc., a full-service accounts receivable management solutions provider, is proud to announce its recent selection as one of the insideARM 2018 Best Call Centers to Work For. This year, only five large companies (150+ employees) met the standard to be selected. State Collection Service was founded in 1949 by Hilding Haag. It remains a family-owned corporation today, with Hilding’s son, Tom, serving as Chairman and Chief Executive Officer, and his grandson, Tim, serving as the company’s President. Under their leadership, the company has grown significantly while retaining the family values that form the basis of the company’s corporate culture. This survey and award program was designed to celebrate excellence among call center work environments in customer care, collections, and outsourcing. Now in its 11th year, the program was established by insideARM, the leading independent news and information provider for the Accounts Receivable Management industry, and is administered by Best Companies Group, which conducts over 60 local, national and industry “Best Places” programs each year. Companies from across the U.S. entered the rigorous two-part survey process to determine the Best Call Centers to Work For. The evaluation consists of a review of each nominated company's workplace policies, practices, philosophy, systems and demographics as well as an employee survey to measure the employee experience. The combined scores determined the final ranking. In addition to being recognized as one of this year’s Best Call Centers to Work For, State Collection Service was awarded this recognition in 2016 and 2017. The company has also been named to the Inc. 5000 list of America’s Fastest Growing Companies, has been named a Wisconsin Family Business of the Year winner, and has been often recognized for its use of advanced technologies including speech analytics for enhanced call performance. State Collection Service continues to maintain its Peer Reviewed by HFMA designation from the country’s largest association of healthcare finance professionals. Through experience and innovation, State Collection Service has grown to become a tremendously credible and nationally-recognized collection agency offering services from pre-registration to bad debt. It is upon the basis of ethical behavior and a dedication to integrity that each State Collection Service employee works to uphold the company's vision – Partnerships for a Lifetime.